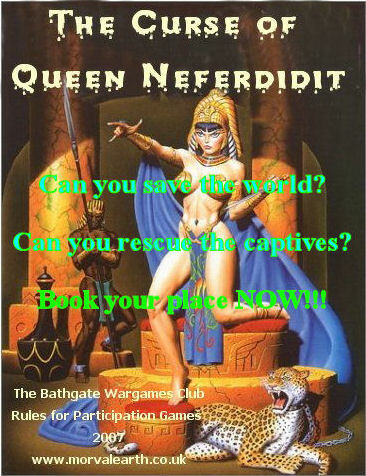 The secret tomb of Queen Neferdidit was discovered by Professor Impetuoso but he and those who discovered it are dead. Killed by the curse that was written on the temple that housed the tomb. 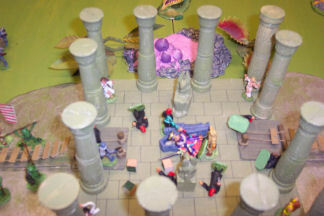 The site was lost again until a survivor, of an expedition mounted by “The International Society of Exploring Ladies” (TINSEL) told a tale of disaster, monsters and the supernatural. She was Lucille Astique, the Belgian who was rescued from a slavers caravan and told her remarkable story of fabulous artefacts, gold and gems galore. They got there through the desert to a secret oasis where long grass, marshes and trees hid everything from view. Not only that, but the oasis was home to strange and fantastic beasts. In the very centre of the Oasis lay the tomb and the remains of the Italian expedition. She also tells of the 4 other members of the expedition that have been captured and held for a ritual sacrifice to awaken Queen Neferdidit and unleash untold horrors and inflict abysmal suffering upon the earth. The inscriptions on the tomb showed a ritual sacrifice of four white skinned female prisoners that would raise the queen from the dead when the planets were in the correct aspect with the star Yuquanutbisirius (You Cannot Be Serious – get it?) directly over the tomb. To cut a long story short, the rescue parties have arrived at the oasis just in time to effect a rescue before the ritual sacrifice takes place if they are lucky! 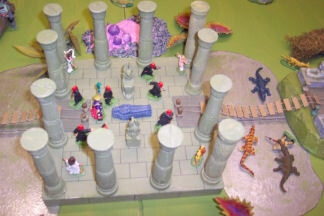 Each of the players represents one of the rescue parties. They each have a main mission (Rescue the correct girl) and also a personal mission (Rescue an Ancient Artefact from the others) to achieve. 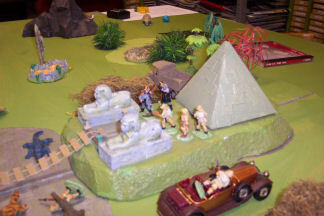 Our version of the Lost Oasis is almost all hand made from simple materials by the veteran wargamer and skilled miniature architect John (Slim) Mumford. The main materials are polystyrene, card, string, aquarium plants and so on all coated with emulsion paints. 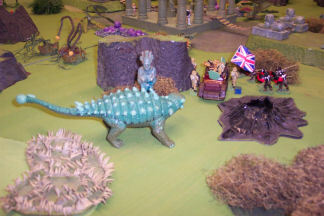 The figures come from the collection of Alan Hamilton from a variety of sources. 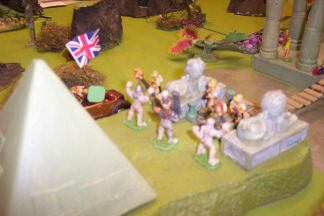 The Heroes are provided by Bob Murch’s Pulp Figures and Mark Copplestone’s Back of Beyond and High Adventure ranges. 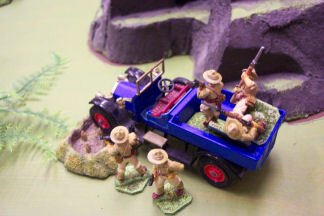 The Villains and extras come from Pulp Miniatures, Foundry’s Darkest Africa range, Games Workshop (Mummies) and ranges. 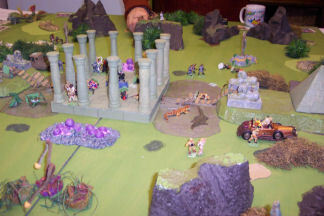 Eureka (Fighting 15s) supplied the Frog Warriors and the Winged Monkeys. 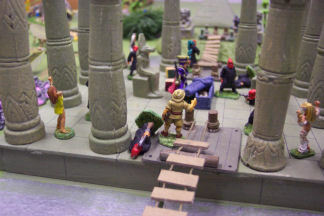 The victims tied to the columns are from various Foundry, Reaper Fantasy, Pulp Figures and other ranges. The plastic animals and dinosaurs are from the Poundshop, Woolworths, Early Learning Centre, Edinburgh Museum and many other places. 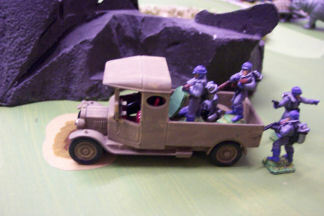 The vehicles are from Matchbox, Corgi and Lledo. 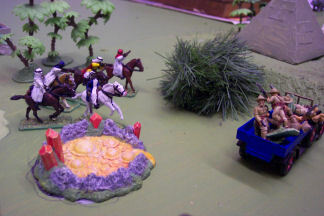 The Tuaregs attack! 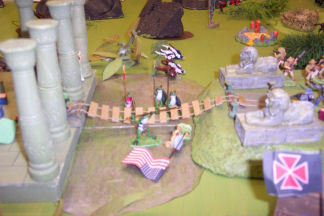 The Flying monkeys prepare to attack. 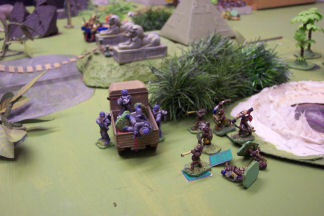 The Pygmies attack Lt Yuri Gonnar. The bridges collapse! 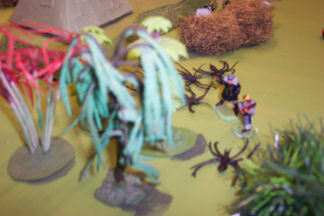 Spiders attack Lt Klaus Zedohr Lt Windy Gale attacks the Cult single handed! 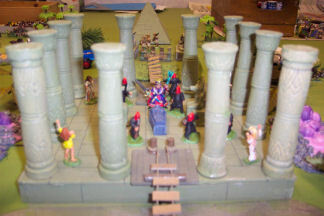 The Mummies Attack! 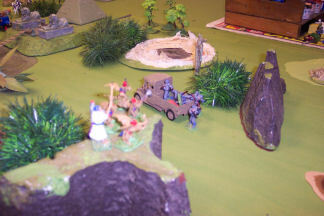 The manphrogs attack Lt Frank Limadeer. Lt Widy Gale secures deals with the cult leader.